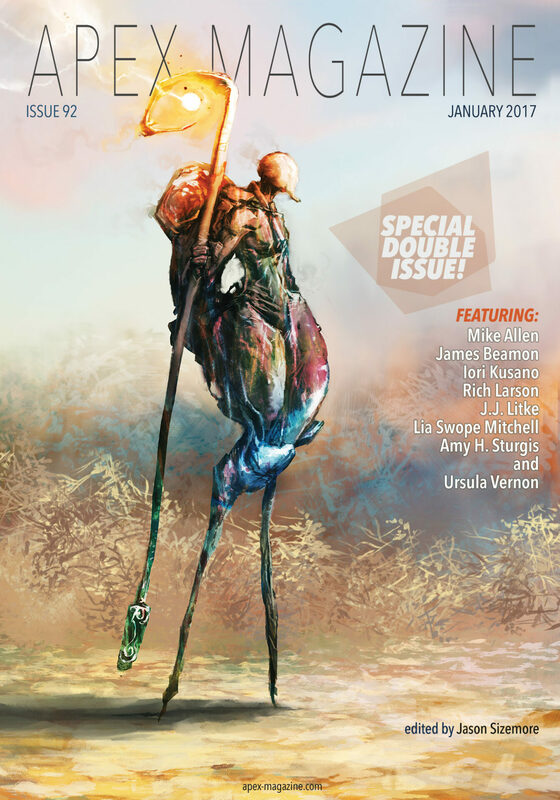 "The Dark Birds," by Ursula Vernon [bio] (edited by Jason Sizemore), appeared in Apex Magazine issue 92, published on January 3, 2017. The revelation that the dark birds are the spirits of the devoured sisters isn’t a complete surprise, since we’ve known that they disturbed Mother and Father both. Con: There is probably a much deeper symbolic meaning to the story, but I'm not able to see it. Baby is completely passive up until the very end of the story, and neither she nor Susan ever becomes a sympathetic character for some reason. They’re victims, but they’re not very likeable. One wonders why Mother didn’t do away with Baby after she witnessed what happened to Susan. A bit darker than I prefer or that I've seen from Vernon before, but very good as I've come to expect. I enjoyed this one a lot, but then, I like dark fairy tales. It loses a star because I thought the ending was rushed, and because it was a clear case of deus ex machina at the end. I've seen it several times. And, yeah, it's not my favorite painting in the Prado.